These statistics offer a window into healthcare in the United States. A significant portion of elder care is done in the home by unpaid caregivers. These caregivers shoulder the burden of healthcare with little or no resources. The time is right to provide these champions of homecare the tools that they need. Some additional numbers to frame homecare in the U.S.
• The majority of caregivers are female (60%)(i). • They are 49 years of age, on average (i). In other words, Medicare pays for treatment, not for elderly care giving. The evidence of home caregiver neglect can be seen in the limited software tools available. There are three categories of tools currently available. To those who have lived in a world of electronic documentation, the popular, recommended, health management approach is difficult to embrace: the three-ring binder. Three-ring binders are correctly recognized as a flexible and extensible way to manage caregiver information. Another approach to healthcare information management is to cobble together a set of disparate software tools to address different caregiving needs. An example of this is reflected in the following AARP post: 9 Need-to-Know Technologies for Caregivers. 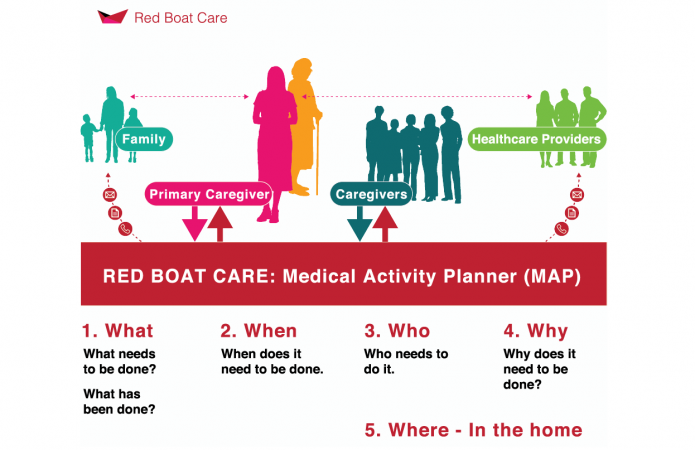 In this post, several different software tools are offered to help with essential caregiving “Medication management” and “Care Coordination” tasks. There are several caregiver software products on the market today. These products tend to focus on the needs of institutional caregiving, e.g. agencies that provide caregivers who go into the home for a fee. A large focus of these tools centers on the management of staff and client accounts, specifically agencies must bill their clients and pay their caregivers. Quite appropriately, agencies logically seek software that features these billing and payroll capabilities. The time is right to build effective software tools for primary home caregivers. Over 35 years in software engineering and user interface/product design. Principal of White Pond Design, LLC. BS, MS Electronic Engineering; BS Physics.